Anicca Digital are taking their A10 Marketing Framework on the road! Ann Stanley, Managing Director at Anicca Digital created the A10 Marketing Framework, to help you develop your digital marketing strategy. Ann will provide a step by step guide to using the A10 Framework. In addition, the senior consultants from the Anicca team, will present an update on the latest digital marketing techniques and how to get the best from your marketing campaign. 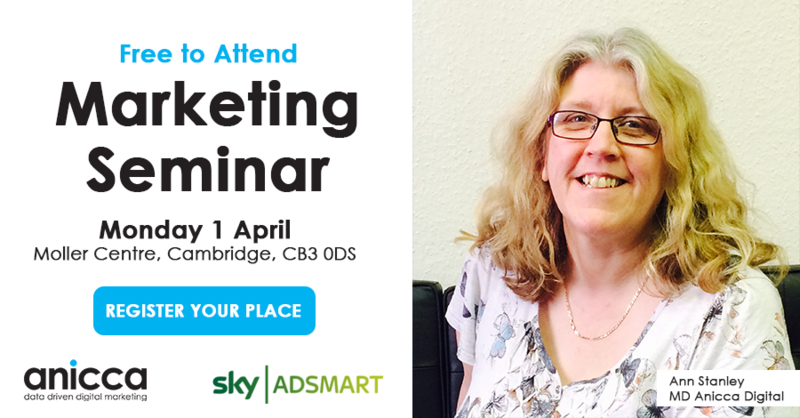 We also have a guest speaker from Sky who will present Sky AdSmart. This is the revolutionary approach to TV advertising which levels the playing field, so businesses of all shapes and sizes can benefit from the advertising impact of TV. With Sky AdSmart different ads can be shown to different households watching the same programme. This means brands and businesses can now advertise on national channels from as little as £3K, providing an ideal gateway into TV advertising that may have been perceived as cost prohibitive before. The event will be held on Monday 1st April 2019 (08:30 – 13:30) at The Moller Centre, Churchill College, Storey’s Way, Cambridge, CB3 0DS.